The first foot pedal spring reverb! Adds classic spring reverb to any amplifier! Zero Noise and Zero Tone Loss - Even on High Gain Amps! 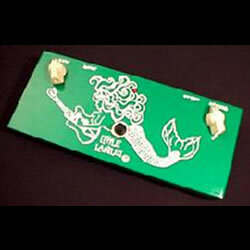 The Little Lanilei Reverb Pedal™ consists of an Accutronics ™ 8" (3) spring reverb tank with a driver stage forcing all that beautiful guitar tone from your guitar down through the springs. The blend knob controls the mix from wet to clean and the gain knob controls the amount of reverb. What does it sound like? Very vintage reverb! Lots of big "lets go surf'n style reverb" with a choice of boominess if pushed too far. Or, how about a classic 1950s space alien movie where you will hear the best lost in space imitation since the 1960s? WOW!!! What fun you will have with it!! Just dial a little verb in for a very pleasing wash and depth and you won't believe your ears. Powered by a standard 9 volt battery, the Little Lanilei Reverb Pedal™ is the only portable foot spring reverb pedal you can take with you anywhere you go. Give it a try! Remote Foot Switch also included.